Entries are now open the the first national champs in 3 years. Being held in Whaka Forest this is not to be missed. Three races, from sprint distance (20min wintime) to long (120min for open men) over the weekend 13/14 Nov. Meanwhile as the NZ Champs approaches (diary 13/14 Nov) there have been good events in both islands. A score event at McLeans Island, a recreation area near the Waimak River on the outskirts of Chch; races at Waiuku and Helensville in the same weekend which attracted riders from afar; and the final of the Wellington series at Upper Hutt. Results have been posted. NZ wasn't represented in last week's World Championship in Israel, but we're extremely pleased to note Australian Adrian Jackson scored two golds! He won the sprint and the long distance. Results are on the website, and also on RouteGadget which enables you to "play" riders against each other. Marquita Gelderman who is ranked 9th in the world, will drop today when she no longer has 8 scores to count. A year ago she placed 2nd in an event in Poland and this score will expire; in three weeks the World Championship in Israel will push off another three scores from last year. The Euro-biassed system will change to a more sophisticated one next year with 5 scores to count; but the foot-o scheme only requires 4 scores. NorthWest OC has combined its next two MTBO events onto one weekend: 22 and 23 Aug. The story of the emphatic victory of the NZ MTBO team in Australia is here. Results are disappearing down the page in South Australia but have found their way onto the Orienteering Australia website. Look under "Results" rather than MTBO. NZ MTBO Championships will be held this year at Roto-vegas, otherwise known as Whakarewarewa Forest, Rotorua. The date (now confirmed) is 14/15 November. 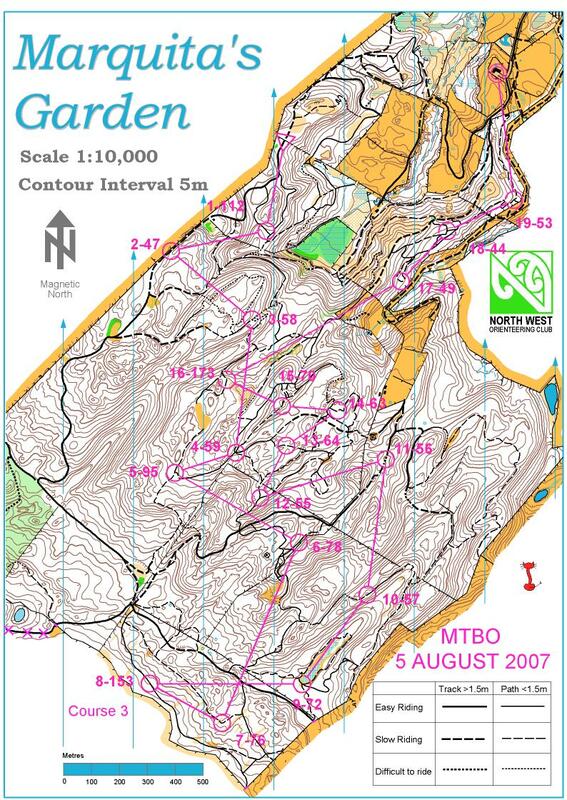 Orienteering Hutt Valley has put pdf versions of some of its maps in a download area on its website. These include the maps for a couple of its "Brownie Events" with the courses on. When this news item disappears, find the link in MTBO Resources. Marquita Gelderman features in the latest "O-Zine", online magazine of the International Orienteering Federation. The world-ranked rider was, unusually, narrowly beaten in Sunday's 3hr MTB rogaine in Riverhead Forest.Meanwhile tomorrow's champions were just starting their careers at the Brownie event in Upper Hutt. After a gap of two years, a New Zealand Championship is on the cards for 2009. There are two possibilities, and to be fair all other clubs have been given until the end of the month to bid. The event would be later in the year. Australia has issued another challenge to kiwi MTB-orienteers, and New Zealand has accepted. The challenge will be based on the Australian Championships at Mt Gambier, midway between Melbourne and Adelaide. Yesterday's Pencarrow (Wgtn) Rogaine offered a bike option - with a 10% penalty. See the story and results to find out if this created a "level playing field" on hilly (up to 180m) reverting farmland. The IOF has announced 31 events that will be used for world ranking in 2009. The MTBO website has been going for 10 years. And sometime recently it clicked over 50,000 hits. Not bad for a small part of a small sport in a small country! But we also navigate on the ride much better than we should: Kiwis hold 11 Australian titles; Chris Forne finishes his first serious year of MTBO with a world ranking of 29; and Marquita Gelderman is ranked FIFTH IN THE WORLD! There's a good trip on offer next June, around the Australian Champs. Rob Garden and Di Michels are organising a 10 day MTBO trip. Kiwis showed well at the Oz Champs near Maryborough yesterday and today. Marquita had a rare loss in the middle but won the sprint and long, Dianne Michels won all three in W40, Michael Wood nearly got all three but for 3 seconds in the sprint. Jacqui Sinclair also won twice, conceding to another kiwi, Alison McDonald in the long. The terrain was pine forest, dead flat for middle and sprint, and a few contours in the long; in spite of that, plenty of route choice through a curly track system and varying ridability. Full results: Sprint, Middle, and Long. The 2008 World MTBO championships have concluded. 6 riders represented NZ with Marquita Gelderman always near the top, sometimes missing medal placings by less than a minute. Chris Forne showed his mapsport versatility by riding very well in the larger mens fields. Georgia Whitla was NZ's first junior MTBO rep, with a best placing of 15th. Races consisted of a sprint on a university campus, and middle, long and relay races in managed forests. Full report in the NZ Orienteering magazine, results here.. Next year's championship is in Israel. The World Championships for MTBO start this week in Poland. Comment will be posted regularly on Maptalk and the official website is here. NZ's best hopes are for Marquita Gelderman who is ranked in the top 10. NZ is also represented in the first junior WOC by Georgia Whitla. Simon Kennett reached the Mexican border yesterday at a little place called Antelope Wells. His time 19 days, 5 hours and 2 minutes and he was 4th. The calendar we use has moved hosts and there were some complications. NZOF has named a team of five seniors and a junior for the World MTBO Championship in Poland at the end of August. Two very different events on Sunday: an MTB rogaine near Okuku Pass in Canterbury, and a beginner event at Upper Hutt. Rogaine results, and Beginner results. Following the events in Victoria, Australia has announced a World Champs team of 4 plus 4. Marquita Gelderman rode in the Victorian Championships near Ballarat at the weekend, winning two of the races and placing third in the other. Results, and look under MTB Events. 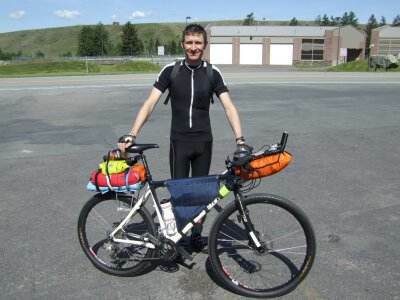 Australia's top MTB-Orienteer, Adrian Jackson will ride the Karapoti race this weekend. The Australian MTBO website has just been replaced by a new section of the main Orienteering Australia site here. With the Cyclic Saga just a couple of weeks away, Di Michels' pattern for a simple mapholder is timely. See it in Resources. As last year, John Randal and Simon Kennett won the 8hr Akatarawa Attack. Tale of the winning ride, and final results. Dianne Michels has been appointed to the NZOF MTB-Orienteering Committee; other members are Rob Garden, Claire Heppenstall and Michael Wood (convenor). The international federation has an online magazine. The latest one features multiple world MTBO champion Michaela Gigon. We have documented the baggage experiences of the NZ MTBO Team crossing the Tasman recently in the Resources section. Marquita Gelderman has been awarded a SPARC "Performance Enhancement Grant" for the 2008 World MTBO Champs. With Rotorua's score event at Highlands Forest over, the next two events are long ones. The Cyclic Saga in Canterbury is NZ's pioneering MTBO event and still the largest. The Akatarawa Attack is a one-day version in the famous Karapoti area. Over a middle, sprint and long distance at the weekend in the Hunter Valley, NZ won 4-3, 4-3, 4-3! This may be the first A-NZ orienteering win on Australian soil. Challenge Results, and also NSW Champs. The NZ team and others are packing their bikes this week for a week's training in NSW, and the Australia-NZ MTBO Challenge. The Cyclic Saga was modelled on the UK "Polaris" events, which also run in Australia. The Oz organiser Wild Horizons has announced "the final Polaris event" in Canberra on 2 Dec. The original UK Polaris continues. Check it out here. And we have just received the first bulletin for the Oz Champs; and now the second bulletin; and now some comments on the champs area. Nominations are now invited for the NZ team for the Australia-NZ MTBO Challenge. Please download this information. Noting Michal Glowacki's results this week: Sprint, 45= (Aussie Randall 14th); Middle, 58th. Randall way down (mechanical?) but blog supremo Darvodelsky 18th. Long Quali 13th (in, along with 3 Aussie men, 1 woman). Long Final 44th. Relay Sat but no NZ team; Aus 15th. More on the superb Ozzie Team Blog. And we've just discovered Michal's blog! Go Michal! Neil Kerrison and Marquita Gelderman were fastest on C1 at Slater Rd near Helensville today. But they know the area well, and Andrew Bott's ride for 4th showed this Hawkes Bay man's potential. Results, and Course 1 map. Australian MTBO has lost one of its key people to cancer. Peter Jackson was a top veteran competitor organiser and mapper in both foot-o and MTBO. While we only have one rider in the world champs, the Aussies have 6 men and 3 women. Team Blog, and Aussie team. The new MTBO calendar uses "Maptalk/Events" which covers all map-sport in NZ. The selection of Norway-based Michal Glowacki for the World MTBO Champs in Czech has been announced. MTB-orienteers on both sides of the Tasman are negotiating an ANZ Challenge in November. Rob Garden is orchestrating a week's prior training. MTBO at Tunnel Gully near Upper Hutt took riders from the tunnel to the waterworks and the rifle range. Results... and comment on experimental new track symbols. Proposals for another "speed value" for tracks, subdividing the variable "unmaintained" category into medium and slow riding. See what you think on this Ozzie map (750k). Clubs from NorthWest to Southland have planned 20 MTBO events in 2007. This time the 8/4hr MTB rogaine starts on the Paraparaumu side of the Akatarawas. 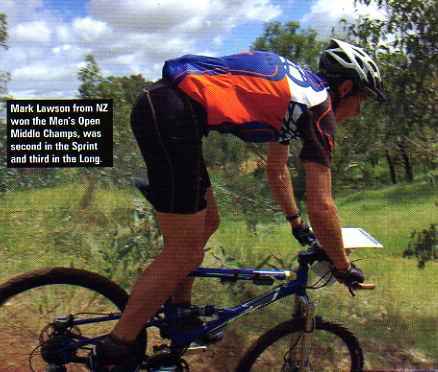 Think Vic in March, 16 Dec 06 Noting Aucklander Mark Lawson's excellent results in the Australian MTBO Champs in WA in October. The website for the Oceania MTBO Champs is up. Ak Attack entry form; the second Makarau Madness, and the original Cyclic Saga. IOF draft ranking events for 2007, with four in Australia. World #9 Marquita Gelderman showed her class in wet conditions in the Wellington Series race at Tunnel Gully. Marquita Gelderman remains in the top 10 in world rankings. She is placed 9th, in spite of having only 4 ranking scores. Marquita Gelderman writes, "the areas used for the World Champs were quite close to town and heavily used for cross country skiing in winter, hence the dense track network - surely we have some areas in NZ with good networks???" WOC lessons and map samples. NZ Championship at Hanmer Springs Entry form. Michal Glowacki handed over in 8th place, just 4-25 down on the Finnish team which eventually won. The kiwi men finished 17th (13th country) while the women were 14th (11th country). Marquita Gelderman placed 18th and Michael Glowacki 37th in the long final. Other results: Fiona McBride 41, Darryl Taylor 45, Stu Lynch 50. Last year we had only two finalists, placing 44 and 49. Marquita Gelderman finished 8th in the middle distance. Also outstanding was 27th for Michal Glowacki, he lives in Norway, not known for MTBO. Other results: Fiona McBride 41, Di Michels 51, Darryl Taylor 74, Stu Lynch 75, Greg Barbour 77. Finland. Qualifications for the long distance today. Ozzie team blog and the Event website. Auckland MTB Club is running a rogaine on wheels. The World Champs team leaves for Finland about now. The NZ team for the 2006 World Championship in MTBO will be: Marquita Gelderman, Fiona McBryde and Dianne Michels, all of North West OC; Greg Barbour (Orienteering Taranaki but living in the Netherlands), Michal Glowacki (North West OC but living in Norway), Stuart Lynch (North West OC), and Darryl Taylor (Hawkes Bay OC). Rob Garden is the Manager/Coach. A two-day event at Hanmer Springs will include the NZ Championship for 2006. The extensive forest was mapped for the inaugural championship in 2000. A brilliant day for riding in Belmont Regional Park in the Wgtn Series. Simon Kennett and Lara Shepherd won the open classes. One Weekend - Three Events, 12 Oct 05: Taieri Plain; Whaka Forest; and Sandy Point. NZ MTBO Champs Entries now open 27 Sep; share transport; Special Ferry Offer on Bluebridge. Results from Whaka Forest; and from McLeans Island 5 Sep 05. PAPO Captures BOTH NZ Open Titles, 1 Oct 01, map added 3 Oct 01.